Zoom Camera so-called VDZ-425 is a high efficiency surveillance camera that can monitor in a dark area. 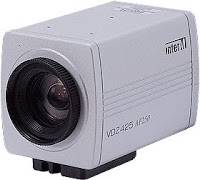 It can monitor 250x maximally by adopting 25x optical zoom lens and 10x digital zoom DSP. Clean and clear video quality: Provides clear and clean images with horizontal resolution of over 480TVL by adopting Sony IT Super HAD CCD of 1/4" 410,000 pixels and ND filter. Maximum 250X monitoring function: Includes a high-performance built-in zoom camera supporting maximum 250x monitoring that adopts 25x optical zoom lens and 10X digital zoom DSP. Excellent low illuminance function: With minimum illuminance of 0.005 Lux implemented by 1/4" high-sensitive CCD and digital signal processing technology, it enables monitoring at a dark area, being suitable for monitoring of outdoor building area day and night. Day&Night function: The camera switches to a mode being suitable for day or night (in AUTO-mode). In the daytime, it switches to a color mode to catch optimum colors; and at night to a black & white mode for more clear identification of dark images. Movement detection: This camera detects the movement of an object without a sensor, and generates a signal. So, if you connect an alarming device to it, monitoring can be done more efficiently. Preset function: Maximum 64 zoom focus positions can be saved, and maximum 20-digit reset ID can be set for each of them. If it interacts with VRM-641, a speed mode controller of Inter-M, you can use this function more easily and conveniently. Auto focus function: Enables easier and more convenient monitoring by adopting 25X optical zoom lens where Auto Focus function is added. PIP (Picture in Picture) function: With PIP function, a screen focus or position can be set easily in a digital zoom mode. ON screen display (OSD): By using the characters displayed on a monitor screen, you can control camera functions, and also set a camera ID, etc. of up to 20 digits. RS-485 and remote control function: You can control camera function remotely by using RS-485 communication or remote control function. Voltage control available: You can control zoom & focus with voltage controller. Implement Microcontroller Firmware in Assembly.